Happy Tuesday friends! We've been knee-deep in searching for a home now that we will be closing our own home at the end of the month. It's nuts to think that we don't have a home to go to when we close (scary!) but also exciting still not knowing what our next home will be. We'll be starting to pack up the house and renting one of those pods to house all of our stuff until we know where we're going, but I thought it a perfect time to take a break from all things moving and share a really perfect transitional look to wear right now. With statement sleeves being everywhere (I'm so glad because I love this trend), it's not hard to find one that you'll love. 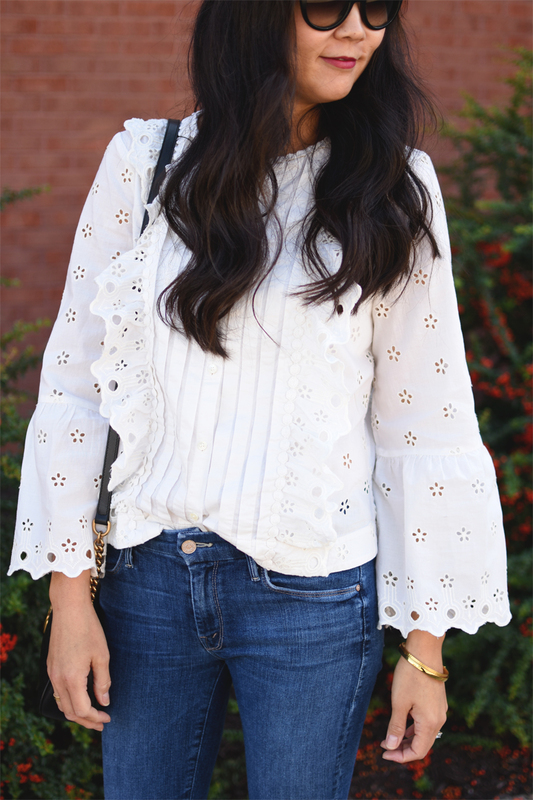 I'm seeing all sorts of embellished sleeves from every retailer now, but this one from J.Crew stole my heart. It's such an easy one to wear and is so flattering. It comes in navy and is on sale when you buy more, just use the code MOREPLEASE and you can get up to 30% off! And talking about trends to love, I absolutely love the mules/slides trend. It gives such an effortless vibe to your look & elongate your legs like crazy and isn't that what we all want? To look as if we didn't try at all? I found the perfect slides that are a steal and come in black too. I actually popped into TJ.Maxx the other day to find some toys for the girls but instead came out with three pairs of shoes for under $45! Crazy good, right?? 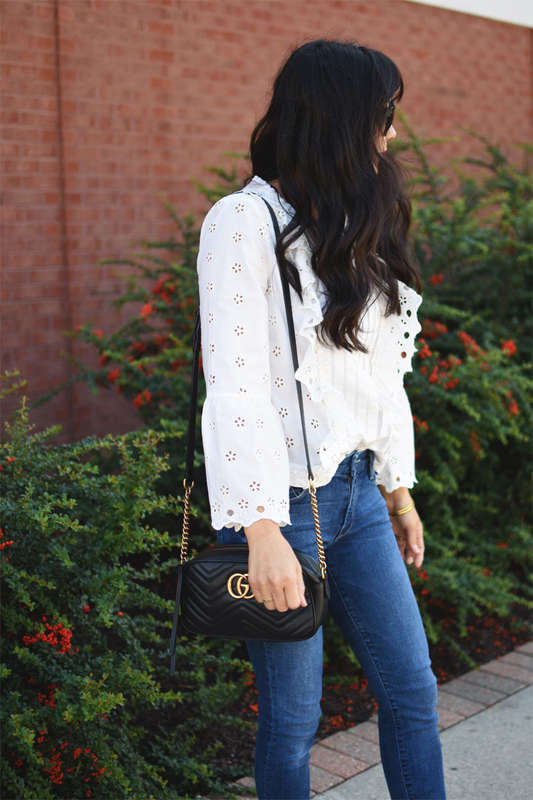 One of those pairs are the ones I'm wearing in this look and were just $17! I found them online for just a bit more but if you can't find them at your nearest TJ.Maxx, then you can easily get them online. Okay, back to packing up the house for me! Wish us luck with finding a house! So if you have been really inspired due to those unique imitation watches designs, you should not get late to contact with replica watches company at all as you will be able to grab the rolex replica sale within bearable price rates. One of the most incredible things about the fake watches is their carved designs, appearing in both embossed as well as debossed shapes. Today engraved rolex replica sale are very popular watches. When it comes to the usage you can use them for as many reasons as you can for sure. For example replica watches uk can be used in different kinds of sociological and cultural celebrations from weddings to birthdays, from New Year to prom night, from seminars to rolex replica from carnivals to sports events, and from dance shows to so on. Due to their multiple uses fake rolex sale are time and again called as memorable watches. Currently they have become hot selling fashion accessories for the people all over the world.